Rare Riviera 35 Bluewater in very good condition for sale. Owner has extensively updated the boat and presents in very good condition. Dual helms are ideal for offshore work with the choice of steering positions, depending on the weather and the owner's comfort. 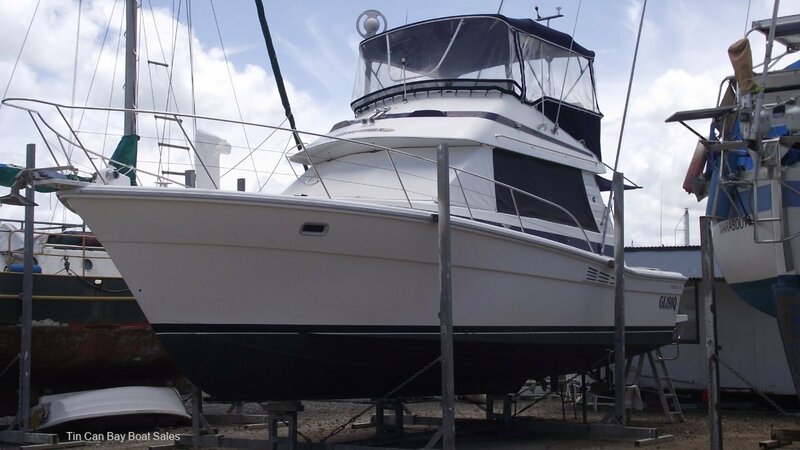 Currently on the hardstand at Tin Can Bay marina, recently antifouled, propsped and new anodes. Excalibur is ready for her next adventure. Also Rare 15m berth available at Tin Can Bay Marina with lease to January 2024 for $10,000 if sold with boat. Berth not for sale if not sold with boat. Genset: Kubota three cylinder 8 kva gen set with new windings. Safety Gear: 2 Rule 3000 gph bilge pumps with float switches. For more information, please use this form. Tin Can Bay Boat Sales offers the details of this vessel in good faith but cannot warrant or guarantee the accuracy of this information nor warrant the condition of the vessel. A buyer should instruct his agents, or his surveyors, to investigate such details as the buyer desires validated. This vessel is offered subject to prior sale, price change or withdrwal without notice.